Very early morning pick-up – 04:15. Smooth flight with two “geographically challenged” (much more polite terminology than my first draft LOL!) women beside me – one American and one German I think. “Oh – look how big the mountains are here and there is snow on them in the summer!” Did they not realize that the place they were flying into – Leh – is in the Himalayas? REALLY? There was also a large French group kitted out in all the latest and obviously newest trekking gear plus a great many other tourists. I had gotten used to being practically the only foreigner in the areas we were working in Tamil Nadu and it will take a bit of adjusting to be one of many – I LIKE being the only! Tsering met me at the airport and it was so good to see him. He has lost a bit of that elfin delicacy and seems more – solid I think but his mega-watt smile is still there. Still hasn’t gotten married – lots to tease him about! 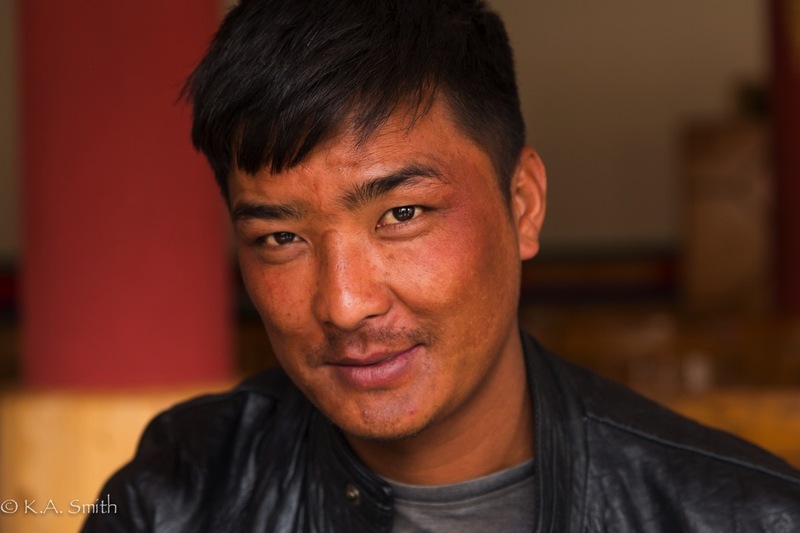 My driver’s name is Dorjee – somehow or other I “knew” that even before I left Delhi – weird. The three of us will be cheek by jowl for the next two weeks so I am anticipating a little solitude this evening before we hit the road. I’m hoping to acclimate as well as I did the last trip. So far I have a bit of a headache and I can feel my heart and lungs working harder but thats about it. Rest, drink plenty of fluids etc. The air has that same clarity I remember and sounds carry very well yet at the same time everything seems slightly hushed. It doesn’t seem to matter where in the world I go, there are pigeons and sparrows everywhere – I have a nest of cheery, chatty sparrows in the window frame of my room at the Noble House Hotel. The pigeons are being stalked by a very stealthy cat and all are benignly watched over by a large furry dog – looks like a retriever husky cross – which would seem highly improbable so it likely just the local breed. Thunder and lightening are rolling down the mountain in front of the hotel; the clouds are eclipsing everything in their path with the inevitability of an avalanche. Looks to be a good storm tonight. 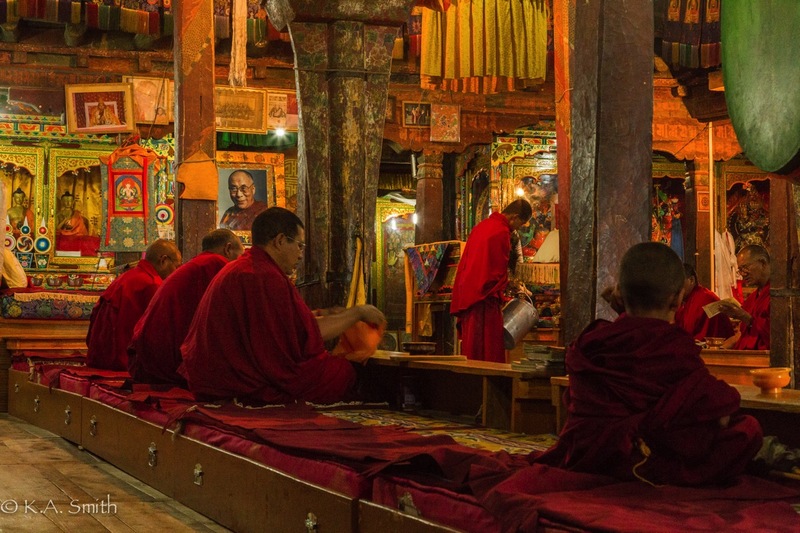 Ok, up early again 04:45 to catch the sunrise and morning prayers at Thiksey Monastery. However the hotel had no power so I dressed by the light of my handy dandy head lamp – Thank You Gudrun for insisting I buy one! 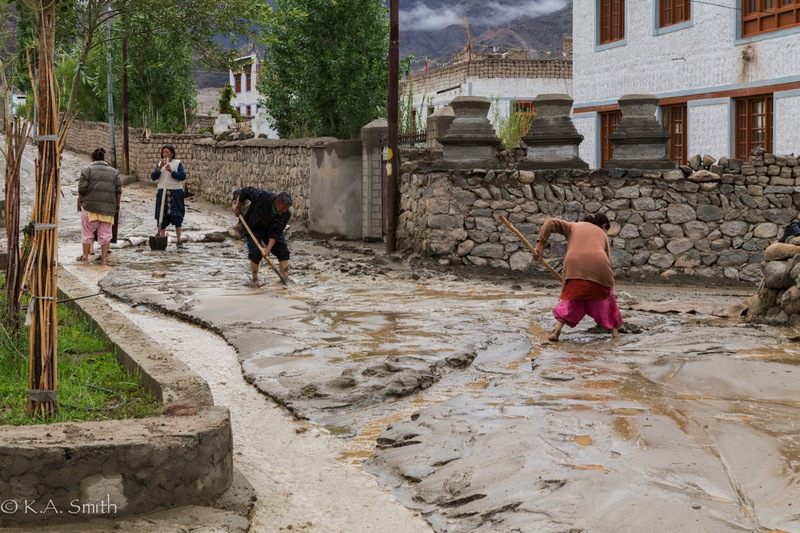 Turns out the overnight rain had washed out roads and turned other roads into mud slurries, created raging rivers – some in the normal courses and quite a few in new and interesting places. 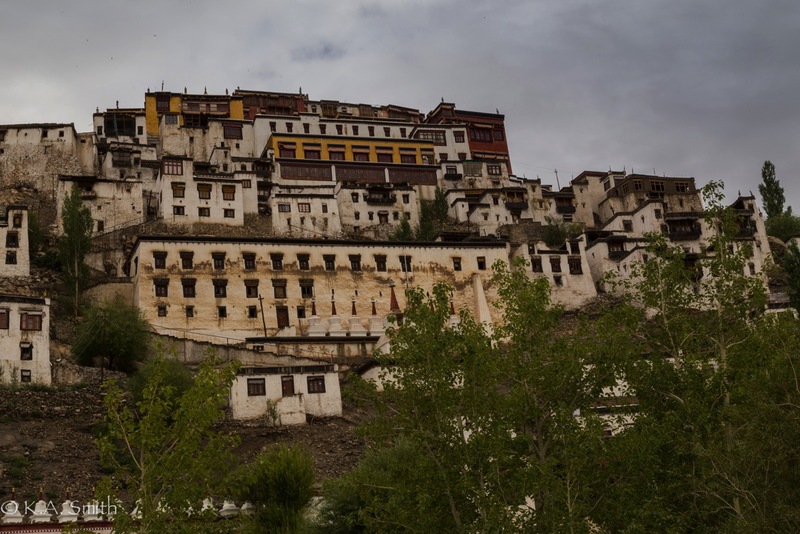 As Tsering rather succinctly put it, “Rain is not a friend of Ladakh.” We detoured three times before finding a route to the monastery – sunrise was a none starter really. We were worried that we’d miss the prayers but the monks very sensibly delayed the process to allow the villages to clear their streets. 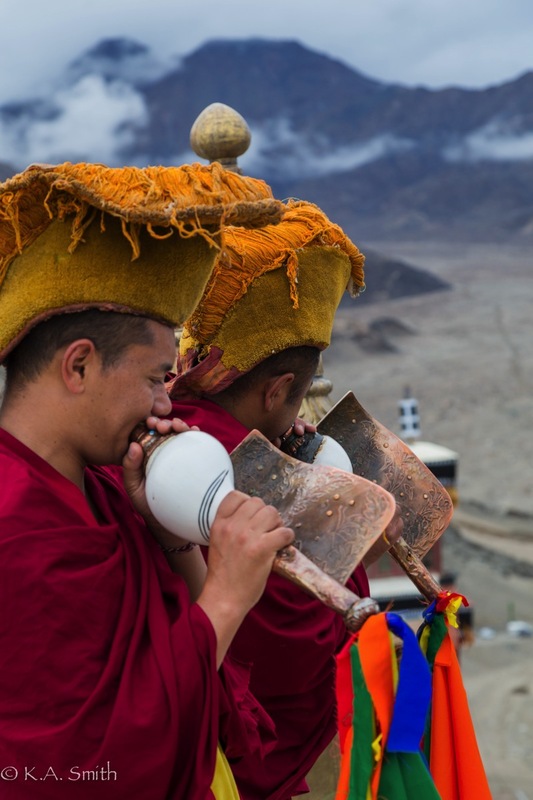 In any case Tsering had me galloping straight up a bajillion steps to the very top of Thiksey to catch the conch horn announcement and then the prayers. I am NOT as fit as I’d like to be and I’m still not completely adjusted to the altitude – besides I swear the top of the monastery is at least another 500 m. higher! I just had to stop periodically to make some shots of the view of course, nothing to do with the fact I was blowing like an old horse! Tsering was not my favourite person just then! 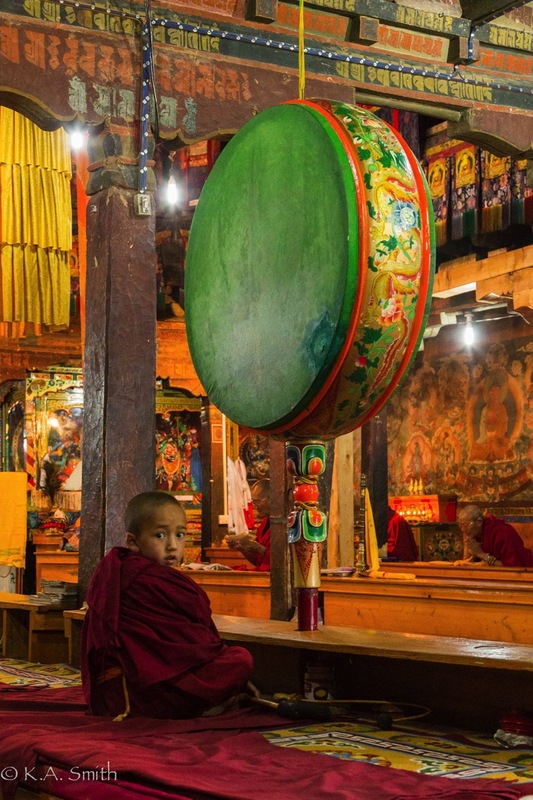 Prayers went on for about 2 ½ to 3 hours; the monks were fortified at regular intervals with breakfast and hot tea – us “spectators” just got to watch enviously. 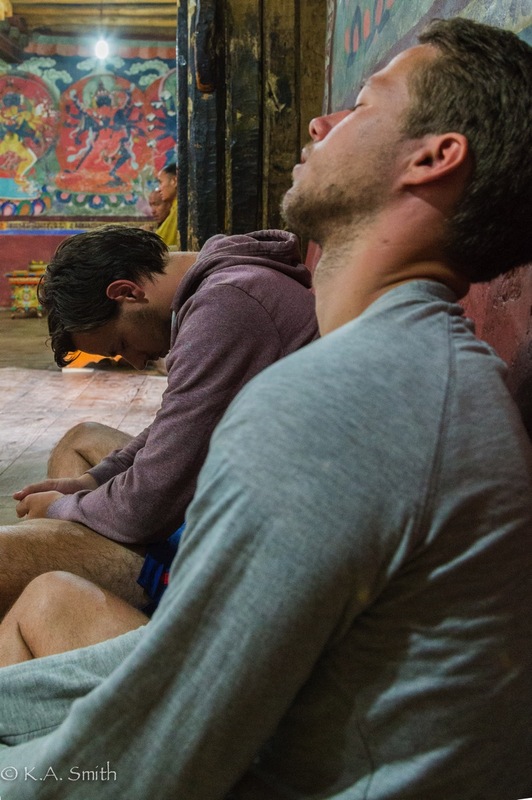 Not all of us managed to stay the course – the two young fellows beside me put up a valiant battle – for about 5 minutes and then dozed off and I crept out after about an hour and a half. I am however, enormously pleased with my bright shiny titanium knees!!! Everything here is built at the very top of things and then they add another 10 or 15 stories – just in case. The idea being that the monks should be removed from the distractions and temptations of life in the valleys, of which they have succeeded admirably in my humble opinion. Once again – not enough bandwidth to upload photos so I will come back to this again at some future point….. SORRY! 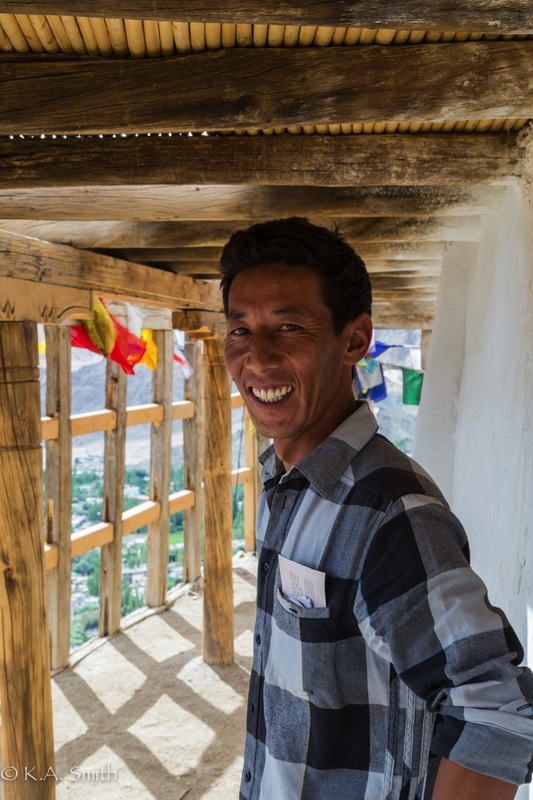 This entry was posted in India 2015, Ladakh, Stories and tagged Thiksey Monastery. Bookmark the permalink. Wonderful to read again. Thank you for posting. 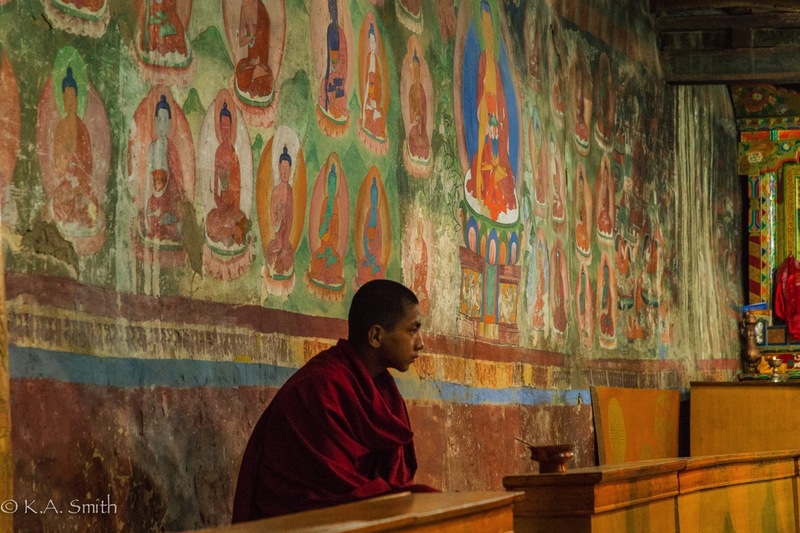 So easy to imagine everything and you and Tsering in the middle. Just farewelled my two Iranians. Non stop but fun. very frustrating for them not to have a credit card or any way of booking anything ahead because of banking restrictions. So we have consumed several hours booking flights to Vienna, and also Paris to Barcelona, train Vienna to Paris ( with the help of Wendy) hotels in Rome, Paris and Barcelona all the way coping with the online restrictions which insist that the credit card which pays must present at point of departure etc etc. Interesting to times together though. he is a lovely musician, a keen wine maker, passionate keep fitter and also loved all the healthy food. Besides being a drilling engineer I think oil industry. Keep writing. I still have no computer. am about to start ordering some Trekking gear for theCamino….